Hong Kong cannot cope with any more high-rise buildings, according to an academic, who says street-level airflow has become worryingly stagnant and unable to disperse heat and pollutants as urban density hits “maximum” level. Though average wind speed levels measured at the Hong Kong Observatory’s remote Waglan Island weather station off the city’s southernmost island Po Toi have been stable over the last 50 years, average wind speed in the city has fallen as more tall buildings are built in higher density. Wind measurements at the King’s Park urban weather station in Kowloon have dropped from 3.5 metres per second in 1965 to just 2 metres per second last year. The decrease in wind speed is in line with a 2 degrees Celsius rise in average air temperatures in the same period. “I would say we are at maximum density, especially in built up areas … Future land reclamation may need to be more disciplined,” said Professor Li Yuguo, who heads the department of mechanical engineering at the University of Hong Kong. Li said poor urban air ventilation could definitely be one of the factors behind days with very high air pollution readings. Studies by Li’s team, which included wind tunnel and water channel modelling, have found that in the absence of wind, convective heat from individual buildings rises and forms a dome-shaped accumulation of warm air and pollutants above the city. The phenomenon is called the “urban dome effect”. “The worrying trend continues but there is no removal strategy for the urban dome,” said Li, adding that strong wind flows felt on some afternoons tend to be man-made “city winds” induced from the “urban heat island effect” rather than natural wind. He urged secondary streets along the northern shore of Hong Kong Island to be kept “wide and short” to facilitate downslope wind flow from the hills. More buildings could also provide basal openings of about 10 metres – such as the ground floor of HSBC headquarters in Central – to help improve low-level wind flow, he said. A green group has called for the return of buses without air conditioning to improve ventilation after finding the air inside some air-conditioned buses had carbon dioxide concentrations four to eight times higher than that in average outdoor air. The higher concentrations inside buses could encourage the spread of illnesses such as influenza among passengers, Green Sense president Roy Tam Hoi-pong said. His group in December conducted half-hour measurements on eight KMB buses and one New World First bus, which were all air-conditioned. The tests found carbon dioxide concentrations ranging from 824 to 3,144 parts per million (ppm), the average being 1,643ppm. The highest was recorded on a KMB route 15 bus running from Lam Tin to Hung Hom. None of the readings exceeded the Environmental Protection Department’s air quality guideline for air-conditioned buses, which regards an hourly average below 2,500ppm to be good and anything below 3,500ppm not harmful to health. Air-conditioned buses also wasted 5 to 10 per cent of their fuel driving the air-conditioning system, he said. Dr Chan said the result was “alarming”, especially in the flu season; viruses would linger in stagnant air and spread among passengers. A survey of 517 passengers by the group found 65 per cent supported use of non-air-con buses in winter. KMB principal engineer Kane Shum Suet-hung said more than half the company’s fleet had electronic air cleaners to filter out contaminants. He said the opening and closing of doors brought in, on average, 8,000 cubic metres of fresh air per hour. Some things will need to change as Hong Kong people demand a more healthy living environment. The sooner our government and politicians respond to this, the sooner their popularity will rise. Even during tough economic times, people still want to protect their health. Inaction on this issue cannot be excused simply because “it costs more”. A headline in the Sunday Morning Post sounded a warning: “Parents question decision to build MTR air vent next to school”. Parents of students attending Bonham Road Government Primary School are fighting the railway operator’s plan to site a ventilation shaft next to the school. The company and government say the shaft acts like a window to improve air exchange and will not spew out pollution. What is interesting is the concern of parents. A few years ago, such a protest would probably not have happened. Today, people are far more concerned about public health. They are asking questions and demanding answers. Parents should focus on how far away schools are from major roads; vehicle emissions are a health hazard for everyone, but especially children. In the US, a school sited within 400 metres of a highway is considered within an air-pollution danger zone. If we were to apply this standard to Hong Kong, many of our schools situated right by busy roads with very high daytime pollution levels would not pass muster. Equally threatening to health is the undesirable “street canyon effect” that traps pollution between tall buildings. Planners and officials might protest that it is impossible to ensure schools in Hong Kong are sited further away from busy roads because of the high urban density, but this assumption should not be taken at face value. We should at least ask how, in a city like ours, we can protect public health, especially of youngsters whose physical development can be impaired by pollution. Children are not just miniature adults: they eat, drink and breathe at much higher rates; their growing bodies more readily absorb contaminants; and their developing immune systems make them more prone to diseases and disorders caused by exposure to toxins. Polluting emissions near schools, where children spend many hours a day, pose a huge threat to students’ health. Although the science is clear, we have not yet taken public health into account when planning our city. Turning on air filter systems indoors will help, to a point. But, if the overall air quality is poor, all of us suffer. In such a dense and built-up city, shouldn’t the attitude be “we need to work harder to minimise health risks” rather than “we can’t do much about it”? The political will of our leaders is paramount. Very little will change from a “business-as-usual” approach. Much more can be done if they adopt the Hong Kong “can-do” attitude our officials so loudly crow about when it comes to business matters. For Hong Kong to have a chance to be a healthier city, the Development Bureau (which is in charge of urban planning), the Transport and Housing Bureau and the Environment Bureau first need to work together, rather than stay in their own bunkers. The heads of these policy bodies need to know, through legislation, what Hong Kong’s priorities are. Laws such as the Air Pollution Control Ordinance need to be overhauled so that public health becomes the clear driver for planning and emissions control. Air quality standards must also be drastically tightened to make them at least consistent with modern health standards in science. The government will argue that it is “reviewing the standards” but, if the whole of the government is not given a unifying vision and mission to make health a top priority through strong policy and laws, it won’t be enough. Parents arise! We owe nothing less to our children. HONG KONG, Feb 19 (Reuters) – A study of more than 20,000 people in China has shown that exposure to burning solid fuel indoors for heat and cooking may cause the lung ailment known as chronic obstructive pulmonary disease (COPD). The finding, published in the European Respiratory Journal, is significant because COPD has long been associated with smoking and very little research has been done to find out why non-smokers also suffer from the disease. COPD includes chronic bronchitis and emphysema. Emphysema is the loss of elasticity of lung tissues, resulting in the collapse of small airways which gives rise to shortness of breath and hyperventilation. The study covered 20,245 people over 40 years of age in seven Chinese cities and provinces who were interviewed about their smoking habits, family health history and exposure to smoke from solid fuels, such as wood, coal, grass and dung. Among the participants, 12,471 were non-smokers and 5.2 percent of them were diagnosed as suffering from COPD, wrote the researchers, led by Pixin Ran at the State Key Laboratory of Respiratory Disease in China’s southern Guangzhou city. The prevalence of COPD among non-smokers varies widely from country to country: 6 percent in Mexico City, 9 percent in the United States and 16 percent in Santiago de Chile. These statistics suggest the illness may be linked to other causes such as differences in lifestyle, behaviour and exposure to various toxic substances. After adjusting for other possible causes, including passive smoking, the Chinese researchers found that exposure to various types of smoke in the home, such as that produced by burning coal and biomass, was the leading cause of COPD in non-smokers. Around 73 percent had been exposed for at least a year to burning fuel indoors for the purpose of heating or cooking. In four out of 10 cases, kitchen ventilation was poor and both men and women were harmed, they added. Nearly four-fifths of the non-smokers, or 78 percent, were also found to have lived with tobacco fumes. It is well known that children of smoking parents are more likely to suffer from respiratory disease as adults and the researchers said the problem will be more acute in China, where nearly 40 percent of adults smoke. “Our results can probably be applied to other developing countries, such as India and Nepal, which have a similar indoor pollution problem”, wrote the researchers. The “canyon effect” is to blame for the much higher level of ultrafine air pollutants at bus stops on “walled streets” in Central compared with those in more ventilated areas, a study has shown. In one comparison, the number of pollutants nearly doubled. The canyon effect refers to the impact – such as poor ventilation and trapped heat – from the creation of canyon-like streets between walls of closely spaced tall buildings. Ultrafine particles can be as tiny as 20 nanometres in diameter – 2,500 times smaller than the diameter of a human hair. harm. Many scientists believe they may be the most harmful form of air pollution. The Hong Kong study was conducted last year by students at the University of Science and Technology. They found the air at bus stops at sites between walls of buildings on streets with heavy traffic had more ultrafine pollutants than that at bus stops in open spaces, seaward streets and indoors. The number of particles at the two eastbound bus stops outside Wing Lung Bank and the old Hang Seng building at Des Voeux Road Central were on average 90 per cent and 75 per cent higher than at the bus stop outside Statue Square in Central. Measurements were taken during evening peak hours on six days between September and December. 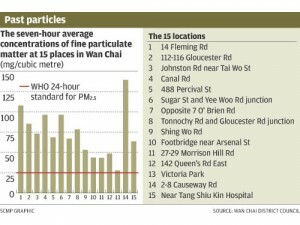 Between 48,000 and 137,000 particles were recorded at the Wing Lung Bank bus stop, between 63,000 and 100,000 at the old Hang Seng Bank building bus stop, and a range of 22,000 to 82,000 at the Statue Square bus stop. For comparison, a benchmark reading of 20,000 was recorded at the researchers’ Sai Kung campus on a clear and fine summer day. Des Voeux Road Central is surrounded by buildings on both sides while the Statue Square stop has more open space in its vicinity, although more buses pass by the square. as buses running on large diesel engines, was the key source of ultrafine particles, he said. Researchers also measured particle levels along three different walking routes between Des Voeux Road Central and Statue Square. Mr Lau said regulating traffic through such means as electronic road pricing or low-emission zones might help reduce the pollution level. Hong Kong should increase the number of air-quality monitoring stations, particularly at the roadside, and incorporate a measurement of very fine particles to give the public a better picture of the health risk it faces, a critic says. The issue has been raised as the government plans to consult the public on the air-quality objectives review early this year amid pressure for it to adopt the World Health Organisation’s highest standards. But the Environmental Protection Department said there was no need to enlarge the monitoring network, although it was willing to consider expanding its fine-particles measurements and publish them online. The city has 14 air-quality monitoring stations – 11 measuring background readings and three roadside readings of five pollutants. The stations measuring background readings reflect the regional pollution, and the roadside ones – in Causeway Bay, Mong Kok and Central – gauge pollution posing a direct threat to people on the streets. Only four general and one roadside station measure the level of fine particles – known as PM-2.5 – which overseas research has found to pose a greater health threat. Last year, the annual reading of fine particles at roadside level in Central reached 41 micrograms per cubic metre of air, four times the WHO standard. “Everybody knows the air quality in North Point is far worse than in Central, even without a monitoring station,” she said. Ms Choy said officials should focus more on getting rid of the wall effect in the city by cutting building heights, and increasing the number of green areas in busy parts of the city. It would seem as if the government is taking a large step towards improving air quality in Hong Kong by agreeing to revise the air quality objectives according to the World Health Organisation’s (WHO) air quality guidance. The latest policy address promised this [so-called] improvement and Secretary for the Environment Edward Yau Tang-wah said later that Hong Kong would follow the WHO standards, but only the preliminary targets. What the government is offering is not enough to improve Hong Kong’s air quality. For example, the annual concentration rate for respiratory suspended particulates (RSP) in the new standard is 70 micrograms per cubic metre. The present RSP standard is 55 micrograms per cubic metre. Why is our government adopting the higher figure, which is a lowering of standards? The WHO’s guidance comprises a series of targets across different stages which leads to an ultimate target. The new figure, in accordance with the WHO’s lowest standard, is not in line with much stricter targets. Why is the government adopting a target for air quality that poses a higher risk for citizens? The air quality objectives that the administration adopts should benefit Hongkongers. If it really wants better air for Hong Kong, it must immediately revise its air quality objectives to the most stringent level. The present level will not lead to an improvement of our air. We should have an air quality constitution, which would lay down all policies related to our air and which would influence areas such as city planning and urban renewal. For example, stricter air quality objectives could halt the construction of buildings that would be responsible for the “wall effect” – blocked air circulation – and they might lead to a reduction of the number of cars travelling through Central and so result in less congestion. Greenpeace is dissatisfied that the government has come up with a piecemeal plan. The government must have a clear timetable and adopt the most stringent air quality standards, so that Hong Kong citizens can enjoy clear air. Improving quality of life is one of the keys to Hong Kong’s continued success. The government well knows that changing property developers’ ways is central to achieving this aim. The so-called wall effect and canyons created by cheek-by-jowl buildings are synonymous with our city, but also make our environment uncomfortable. It is therefore good that authorities are considering significant changes to the present system. Land being a premium has naturally meant that developers have done their utmost to maximise its potential. Scarcity means high values which translate into economic considerations being foremost when sites are planned. As a result, buildings with little or no space between them line the waterfront and hillsides. The views are spectacular, but for those at street level, the lack of air circulation and sunlight can be stifling, especially in the humid months of summer and when pollution is high. As we report today, a public consultation could start as early as next month to look at a vastly different development approach. Among proposals are that only 70 per cent of the length of a site can be used, ensuring better air flow between buildings, and that 30 per cent of the total area be set aside for greenery. Such a model seems on its face to be a much-needed breath of fresh air for our city, but it needs to be carefully considered. A balance has to be found to ensure that developers are not overly jeopardised; height restrictions of buildings may have to be relaxed to compensate for area densities being lessened. There is significant reason for a rethink. Developers who presently voluntarily add green features like podium gardens to buildings are given incentives such as extra floor area. This has not always been conducive to improving the environment. There are cases of the system having been abused, to the detriment of the community. The government is to be commended for taking environmental concerns firmly on board and pushing ahead with finding a better system. If Hong Kong is to flourish and thrive, we have to improve living standards. But developers have to be listened to and rules made flexible. With care and forethought, the mistakes of the past can be avoided.